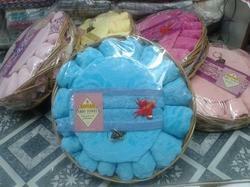 Trading and Outsource Manufacturer of Towels and Handkerchief. Prem Chand Brothers is a leading partnership firm that is engaged in the manufacturing and exporting of wide assortment of towel such as Terry towels, Jacquard Towels, Bath Towels, Kitchen Towels, Knitted Towels, Salon Towels, Kitchen Aprons, Bed Coverings, Printed Kitchen Linens, Cotton Table Cloths and Kitchen Linen. These products are soft to the touch and have great absorbing qualities along with shrink resistance and are harmless on the skin. Our products are crafted and designed to suit the needs of the customers and are known for their softness, quality, great patterns and designs. We try to give an elegant and sophisticated look to our products. Apart from being used in hotels, our products are used by our clients either at home or at office or at any place of their choices since we produce products to suit the various requirements of our clients. We have a well equipped production unit that is backed by an excellent team of professionals who initiate all the work without any hesitation and help us in meeting the bulk orders of the clients. Our team has thorough knowledge of the market trends and adapts to the changing trends of the industry. We have adroit designers and craftsmen who craft the range of towels and home made ups to suit the customer requirements keeping in mind that the products still maintain their quality and also their softness, matchless patterns and designs. Our team ensures that the products manufactured have an elegant and sophisticated look to the application area. Prem Chand Brothers are always in the process of designing a perfect range of towels and home made products. These are crafted and designed in compliance with the requirements of the clients. • Tailor made with matchless patterns.